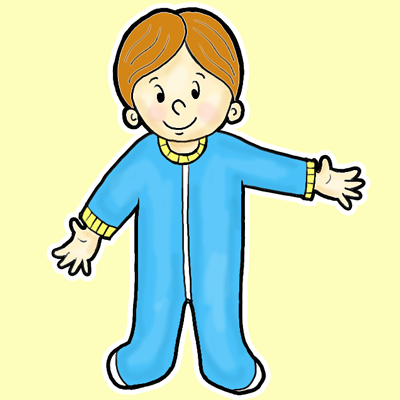 Today I will show you how to draw a cartoon toddler boy with sleeper footsie pajamas on. 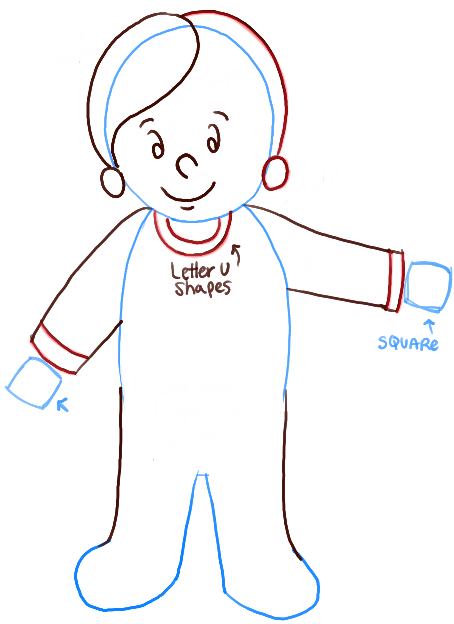 We will guide you to drawing him with simple geometric shapes, alphabet letters, and numbers. Have fun learning how to draw him! 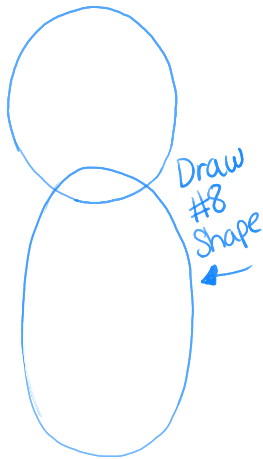 Draw 2 ovals in a #8-like shape. – Draw backwards #6-like shapes for eyes and a letter ‘c’ shaped nose. 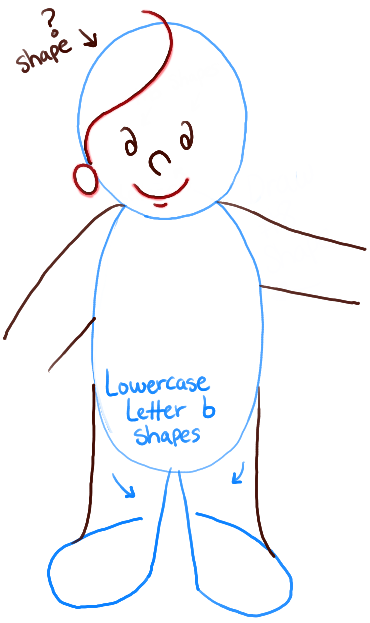 – Draw lowercase letter ‘b’ shaped feet. – Draw a ‘?’-like shape on the left side of the face. – Draw 2 curved lines for the mouth and lower lip. 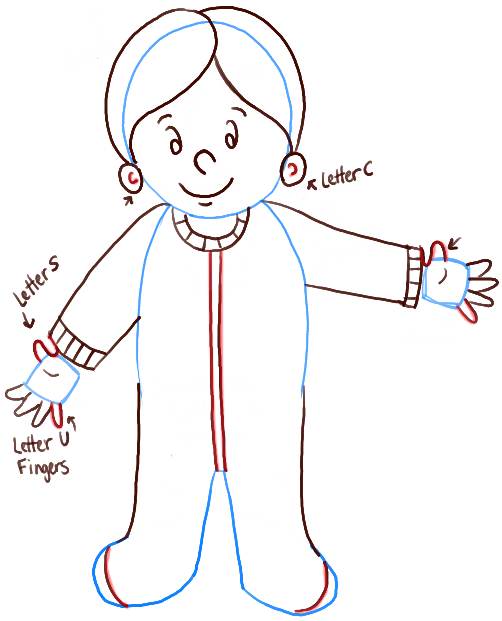 – Draw 2 lines for each arm and a curved line on each leg. – Draw a curved line on both sides of the head for hair. – Draw a circle for the right ear. – Draw curved lines for each sleeve. – Draw a square-like shape for each hand. – Draw a letter ‘c’ in each ear. – Draw a letter ‘U’ shape for each finger. Draw a letter ‘s’ shape for each thumb. 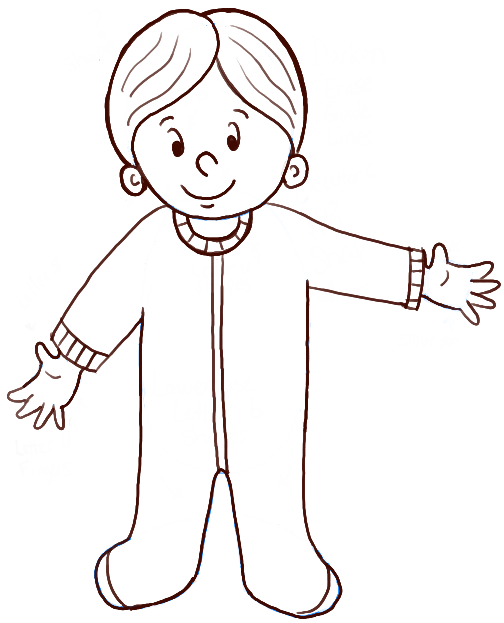 – Draw 2 lines in the middle of the pajamas…and draw curved lines on each foot. – Erase guidelines and thicken the right lines. I hope that your drawing of a cartoon toddler came out really well and that you enjoyed learning how to draw him. Come back soon for more drawing and cartooning tutorials. This article was written on 03 Feb 2014, and is filled under Babies and Toddlers, Cartoon People, Drawing for Kids & Preschoolers.